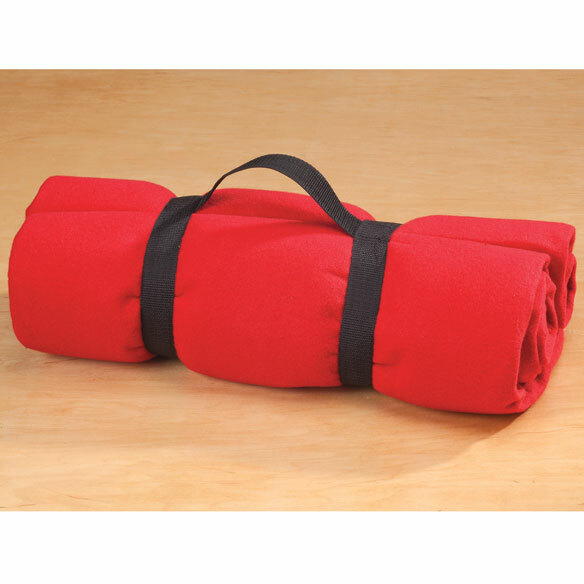 Innovative hooded youth emergency blanket by LivingSURE™ keeps kids warm and safe in an emergency. Hooded blanket with hand pockets features a high-tech, waterproof foil shell that helps retain body heat. Soft fleece interior keeps them cozy — also makes a great picnic blanket on the go! 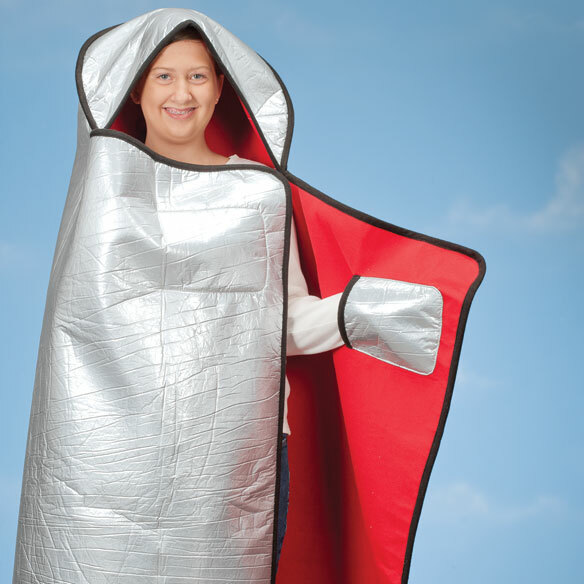 Reflective blanket folds to a small roll with a handle. Perfect for car, camper, home and travel. One size fits most youth. Machine wash.
What a great idea to line it with fabric!! Cozy and warm! All the drivers in my family are getting one for Xmas to keep in their trunk!! This is really neat. It will fit a 5'2", 185 pound person and still close..It also will fit a 5'6",230 lb person, just is a bit snugger. It is really nice! I haven't used it yet but I tried it on and I liked it. It is middle of March. We had snow. And today it is 29 degrees. I used to be a Girl Scout. Always be prepared. Want to keep in our vehicles. Live in Maine and wanted to add item to winter emergency items in car." To keep in the car for emergencies. For in the car In case of accidents. perfect for my emergency kit. I can't stand the cold. May use it next time my furnace breaks. what are the measurements for this emergency blanket? BEST ANSWER: Thank you for your question. The BLANKET MEASURES: 64" x 48", POCKETS 7 1/2" x 6", HOOD 23" x 9 1/2". We hope this information will be of help to you. What are the dimensions of this item, also the size of the one for adults? I cannot locate a different picture to add to this post. Thank you. BEST ANSWER: Thank you for your question. The Kid's measurements are BLANKET MEASURES: 64" x 48", POCKETS 7 1/2" x 6", HOOD 23" x 9 1/2". The full size measurements are Measures 73 1/2” x 57 1/4” without hood. Hood is 24” x 9 1/2”; each pocket is 6” x 6”. We hope this information will be of help to you.